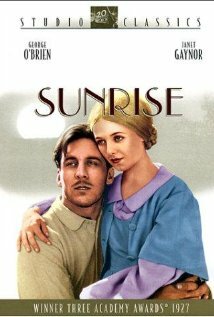 The next movie on my journey to watch all the top 100 AFI films from 100 to 1 is the 1927 silent film, Sunrise. F. W. Murnau directed this film. I haven’t watched too many silent films in the past. When I popped the Sunrise DVD into the player and hit play I felt silly. I knew that it was a silent film. However, when the credits started there was no sound. I grabbed the remote to turn the sound up. Then I had to laugh at myself. It was just an instinct to turn it up. I’m so used to sound. The first minute or so are completely silent. Afterwards, there is music adding to the mood and tension of the film. The movie Sunrise is based on the short story, Trip to Tilsit, by Hermann Sudermann. When the movie starts you meet a man (George O’Brien), who is a local farmer. He’s married to a woman (Janet Gaynor). At first their marriage is happy and they have a child together. Then the farmer falls for a seductive woman from the city (Margaret Livingston). She convinces the farmer to move to the city with her since it is an exciting place to be. However, the man asks what he should do with his wife. How can he just leave her? The mistress says, “Couldn’t she just…drown?” The man agrees that this is the best method. The next day, the husband plots to take his wife out in a boat and then fake an accident. He brings some bushes to help him stay afloat after he capsizes the boat. The wife figures out the plan and is terrified. Seeing her face and her fears changes his mind. He can’t go through with it. But now, can the wife forgive her husband for attempting to kill her. Or for even thinking about it? Many regard this to be one of the best silent films ever made. Since I haven’t seen too many, I can’t back up this claim. What I can say is that I thoroughly enjoyed the movie. I loved the special touches the director used. For instance, when the mistress says that the man should drown the wife, the words on the screen (remember it is a silent film and there are subtitles) slowly disappear like they are drowning. The movie won Oscars for Best Actress for Janet Gaynor, Best Cinematography, and Best Picture. This was the second film by F. W. Murnau that I’ve seen. And even though I really enjoyed this film, I have to say I enjoyed his movie Nosferatu more. Has anyone seen both of these? Which do you like best? This entry was posted in Movies and tagged AFI, AFI Top 100 Movies, American Film Institute, Best Cinematography, Best Picture, F. W. Murnau, Hermann Sudermann, Janet Gaynor, Movie Reviews, Movies, Nosferatu, Silent Films, Trip to Tilsit. Bookmark the permalink. Kudos to you! I admire your determination – I don’t think I am ready for any silent or b&w movies 🙂 Mind, I am not big on movies anyway. Remember I said a while ago I’ll try to watch Father and Son and let you know my thoughts about it? I am still trying 🙂 But that is mostly because I can’t find it online and it’s not available on dvd in my neck of the woods. Thanks for your review! I don’t know how popular Father and Son was so I’m not surprised that it is difficult to track down. I’m having a hard time tracking down Spartacus, which is next on my list. That one surprises me a little. I think it might be on cable next Saturday so hopefully I will be able to watch it then. But my DVD mail rental service and the DVD rental shops around here don’t have it at all. Good luck finding Father and Son! Yes, great review. I’ve never seen either one because I don’t like silent films at all. But after seeing The Artist I’ve changed my mind. If an actor can make you feel something with just their facial expressions and movements, it’s pretty amazing. It is surprising how much an actor can convey when they don’t speak. I also found that I had to pay closer attention to the movie. With sound, if you get distracted you can still follow along by the dialogue or sound effects. If you look away from a silent film, you may miss quite a bit. I haven’t seen the Artist yet, but I want to see it. I loved Nosefratut. Quite uncanny, really. I didn’t even know this one and I’m not too tempted. I like silent movies when they are a bit scary. Nosefratut? I can soo not type and still have not learned my lesson whic is : read and then press post. I do it all the time…no need to apologize. Scary silent films do keep my interest more. And I enjoy them more than today’s scary films. I think I have a couple more silent films on my list, but I don’t think any scary ones. I don’t think I’ve ever watched a silent film. Of course, my husband’s not a big fan of subtitles in general. I had to watch this one by myself since I knew my family wouldn’t be impressed with the subtitles. I’ll have to give the silent movies a try. I’ve been meaning to see The Artist since it won the Academy Award. Now, based on your review, I have a couple more options. I still haven’t seen The Artist but I want to. I’m trying to watch more silent films. One of my friends in Boston loves them. Thanks! It is wonderful to have you along. This does sound like a classic. I know i should be watching more films but my husband and i have grown so used to the pacing of TV series that there are times when we find movies way too long. Have to shake that feeling off. Funny you say that since I am trying to get more into TV shows. We recently finished the Brit Comedy The Inbetweeners and there are a few more British TV series I want to tackle. Great review…I don’t think I’ve ever watched a silent film. I have watched foreign films with subtitles. Thanks!